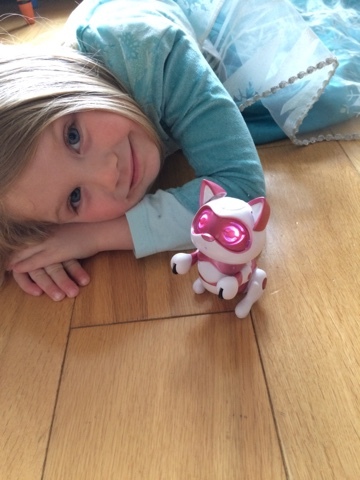 Maegan (age 4) was really excited about helping me to review the latest Teksta Newborn Kitty, she's easy to remove from her packaging but batteries are not included so you need to fit them before you can play. Newborn Kitty has light up eyes and a rage of sounds and expressions from singing a selection of songs to happy sounds. Kitty also has a variety of tricks from begging to jumping - the box says you can practice to catch her i your palm although we haven't yet - we've come close! You can train Kitty to respond to voice commands. Maegan loves how Kitty walks around and has wiggly ears and tail. 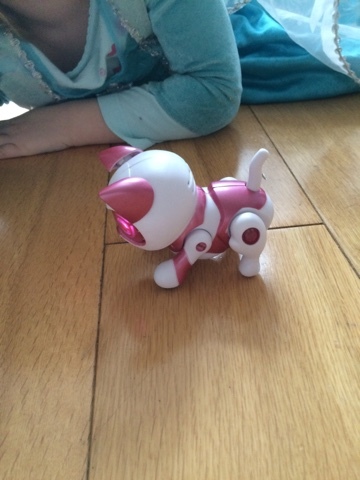 "Introducing the new generation of micro robotic pets that are smaller, more interactive and animated than ever before. Newborn Teksta Kitty is a sweet and adorable life-like robotic Kitten that responds to your voice and touch. Engineered with state-of-the-art artificial intelligence, Tekstas’ toyetic interaction offers many emotions and expressive light-up eye patterns to share her feelings. 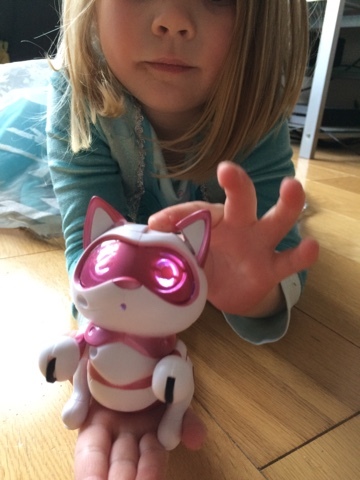 As your devoted companion, using cutting edge hand gesture technology, you can command Newborn Teksta Kitty to sit, walk, beg and sing. Newborn Teksta Kitty is just like a real 8 month old Kitten and will excite and inspire children of all ages. " 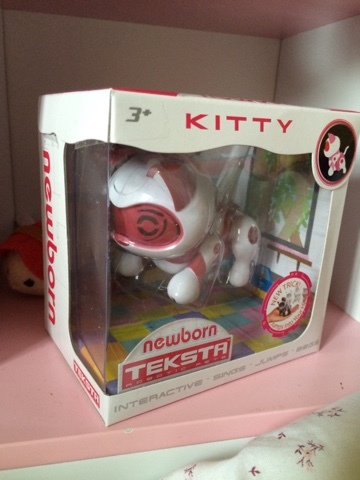 disclaimer - I received Teksta Newborn Kitty for my consideration, all thoughts and images are my own.